Gunfleet Sailing Club’s young members came to the fore when they held their Annual General Meeting in the Clubhouse. Cadet Officer Claire Aylen welcomed the Club’s Cadets and Otters and handed over to retiring Cadet Commodore Harry Swinbourne who reviewed the last year. Highlights of a full programme of activities, both on and off the water, included the Sailing On Saturday, with its highly successful sail training programme, and culminating in an exciting Cadet Class Points Series. The top three Topper sailors in the second SOS class race. From left to right: Alfie Searles who cam second, Harrison Smith who won the race, and Ted Newson who came third. 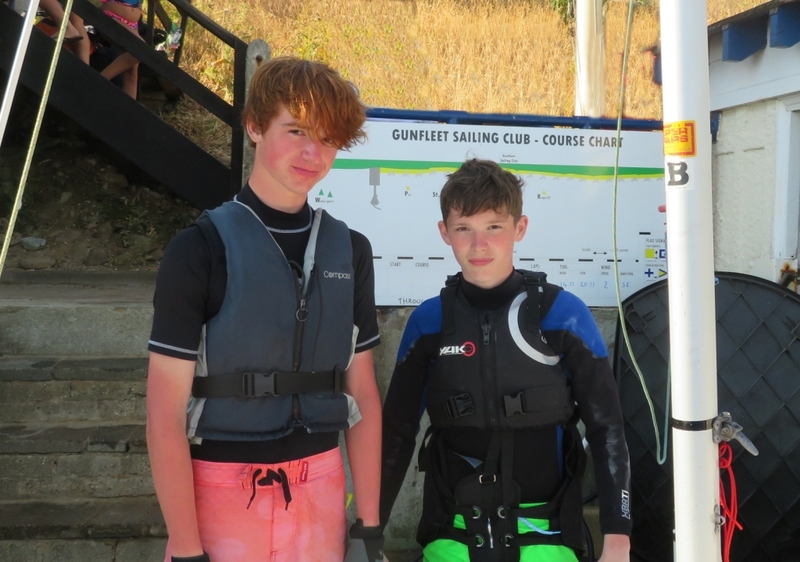 Gunfleet Sailing Club held the second race in its Cadet SOS – Sailing On Saturday Class Points Series with the Club’s younger members continuing to show their sailing prowess, following several weeks of enthusiastic sail training. Monday... Mornin’ all, good to see all my old mates again. It’s been so bloomin’ hot at school and now we’re having a week of fun and it’s blowin’ dogs off chains. OMG (that’s Oh My Gunfleet to the uninitiated) you’ve grown, shame it’s not upwards, ARF, ARF; and what do you mean, I shouldn’t be surprised if a Cadet grows a beard? You’re a girl!!! Oh, oh, there’s the Commodore, I’ll keep clear of him, only I borrowed a fiver off him last year and I think he’s forgotten that I never paid it back. Whoops, what was that? I think his brain has just burst into life. On Saturday it was Cadet Day, which started with an all-in handicap race for the Cadet Day Cup. In an impressively close start it was good to see Harrison Smith forge ahead in his Topper, whilst just behind him were Harry Swinbourne and Jessica McLean-Wright in their Topaz. Several other Topazes and Toppers followed, and bringing-up the rear were Ed Philpot and Henry Spooner in their 405, this being the first time the two had paired-up together. The light onshore breeze aided the fleet on its way to the Kingscliff buoy, as well as helping the craft to combat the flooding tide. Yes...it's on the way - Gunfleet's 2018 Cadet Week, from Monday 30 July to Friday 3 August, with the "Wham-Bam" Cadet Week Party on Saturday 4 August. Loads of new trophies to be won; some for the most wackiest things you can think of! 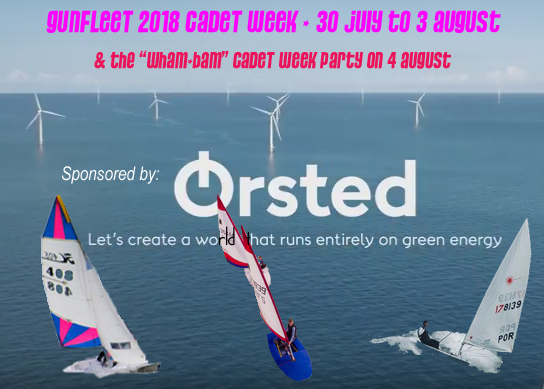 Sponsored this year by Orsted, it's going to be a brilliant week of sailing and games, both on and off the water.....and there's more, so watch out for updates here, in the Gunfleet Gazette, and in Splash! It was a case of swapping buoyany aids for bowling balls on Saturday afternoon 24 February as a group of Gunfleet Cadets and Otters got together at Clacton Pavilion for their own Bowling Tournament. Organised by Cadet Officer Claire the ages ranged from six to seventeen years and there was two hours of fun and laughter, plus a bit of series “skittle flattening”! Gunfleet Sailing Club burst into life last Saturday afternoon when more than 20 Cadets and Otters held the first in their Socials On Saturday for 2018. The theme was Games ‘n’ Grub and the Club’s younger members exceeded at both. Whether it was Battleships, Connect 4, Olympic Yachting or even Scrabble, everyone settled down to play board games or table challenges; the cosy Clubhouse providing a perfect venue as the rain fell outside, and the sea was rough and grey.